So this is the last installment in the Jeju series. So as I mentioned, Jeju has an area called the Jungmun Resort Complex which is home to two of the most popular hotels in Jeju; the Lotte and the Shilla. Our goal for the weekend was to relax and to see a few sites. So for those of you looking to relax, there is plenty to do in the Jungmun Resort area. At the Lotte Hotel alone there are quite a few pools, hot tubs, sauna, and water slides for those looking to enjoy some fun in the sun. Then at night there is a volcano show at 8:30 PM that is actually pretty entertaining. Lotte claims it is better than any Las Vegas show. Here is a video of the show and you can decide for yourself! Additionally, you can hit the Casino anytime you want. However, I must say that the Lotte Casino was VERY smokey, I preferred the Casino at the Shilla. Make sure you bring your passport as only foreigners are allowed into the casisno. 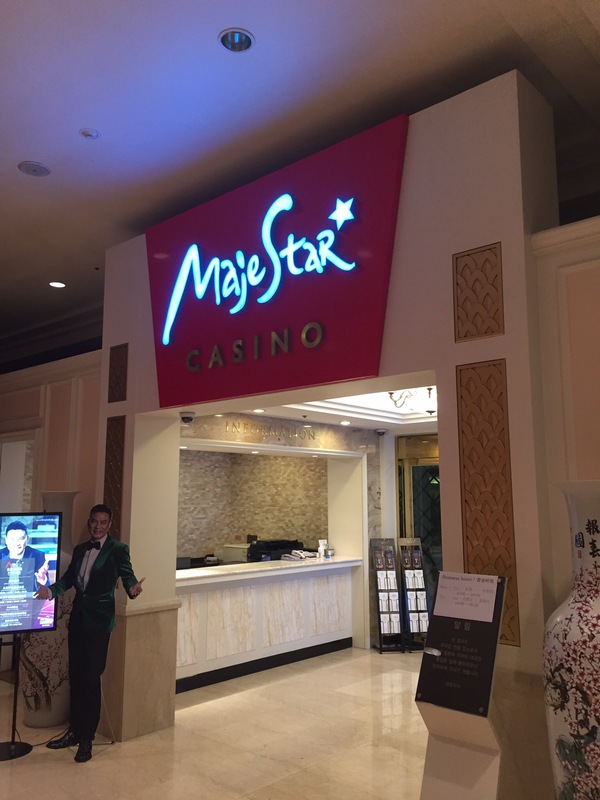 You will see mostly Baccarat tables, as the majority of people in the casino are Chinese tourists. They also had blackjack and roulette and big/small. Minimums started at 10,000 won (5,000 won for roulette). If you are still bored after all checking out all of the resort amenities, you can stop by the Jungmun Beach and enjoy some surf and sand. I definitely recommend renting a car as driving in Jeju is much less stressful than driving in Seoul. Car prices are pretty reasonable and all the cars come with GPS navigation that helps to tell you about every speed camera, speed bump and other road hazard. One tip about using the GPS navigation is do not enter the address of the place you are going, just enter the phone number. It will quickly populate the address and take you there with no issue (it’s a great system!). If you do rent a car or hire a driver for the day, here are some additional places that we visited that you might be interested in visiting as well. 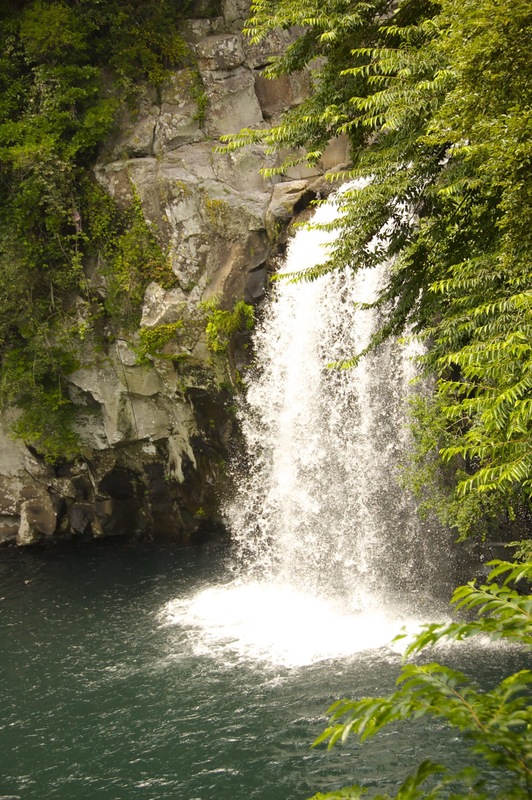 You should note that the first waterfall does not flow when there has not been heavy rains, so we weren’t able to see that one. 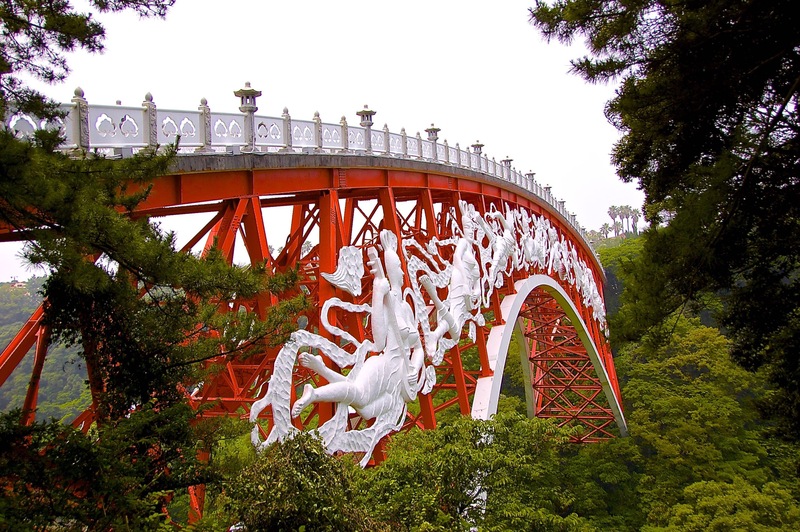 While you are viewing the waterfalls, you can also see the Seonimgyo Bridge. 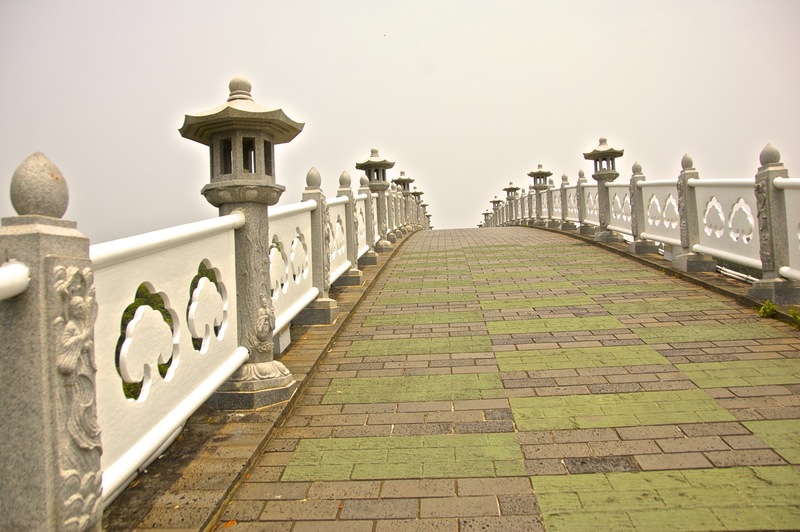 The Jusangjeolli are rock pillars that are a hexagonal shape in varying sizes and all pressed together. 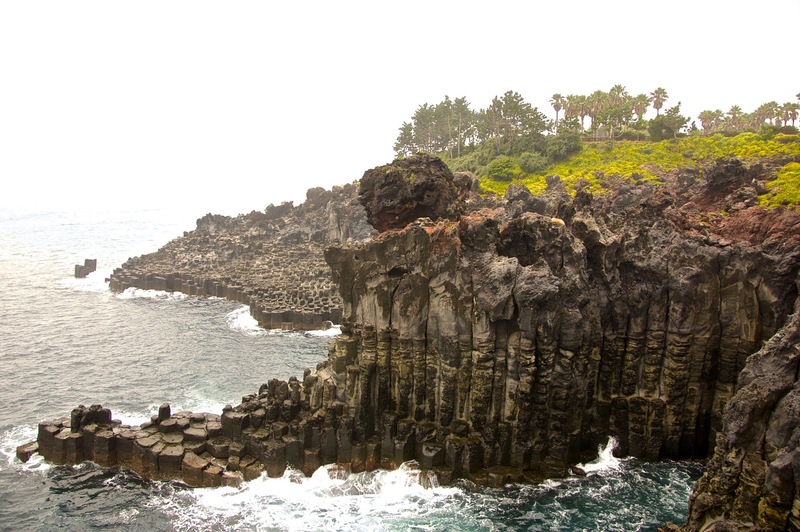 When you see them, they don’t appear like they are natural formations, but they were formed when the lava from Hallasan Mountain erupted into the sea of Jungmun. The view is nice and it is a simple walk around the area of the shore to see them. 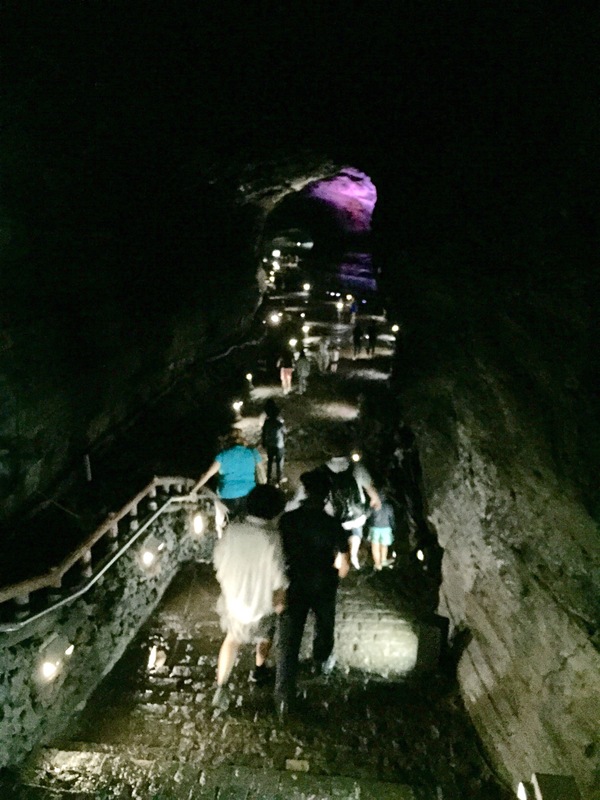 The Manjanggul lava tube is 7.4 km long. It is one of the largest lava tubes in the world having a main passage with a width of almost 60 feet and a height over 75 feet! This lava tube has a well-preserved passage shape and internal micro-topographic features in spite of it’s old age. 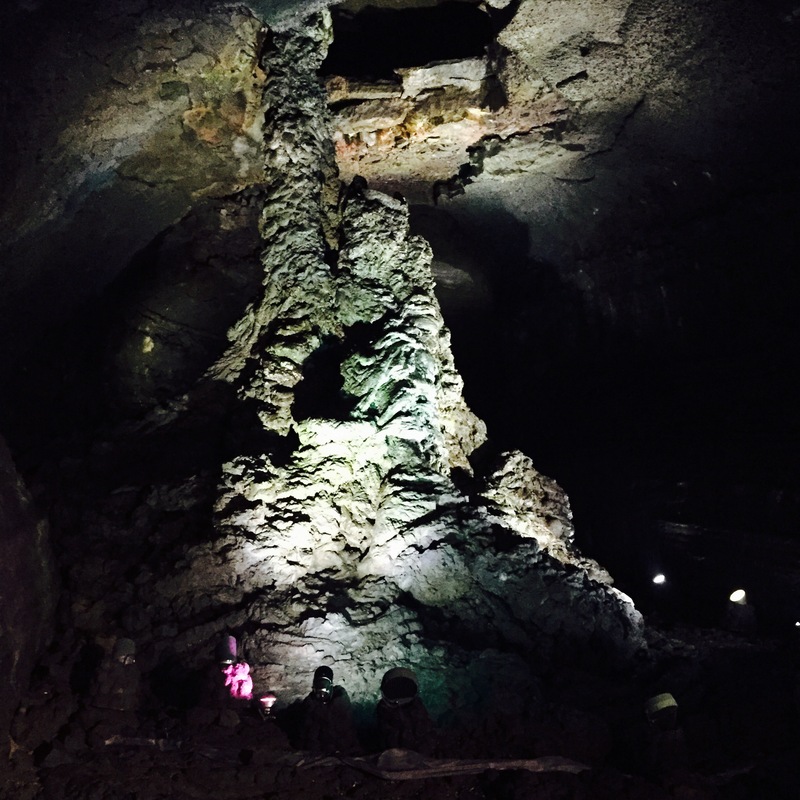 A variety of lava formations can be seen from inside, such as lava stalactites, lava stalagmites, flowlines, lava benches, and lava rafts. The 25 ft high lava column inside the Manjanggul Caves is the larges lava column in the world. 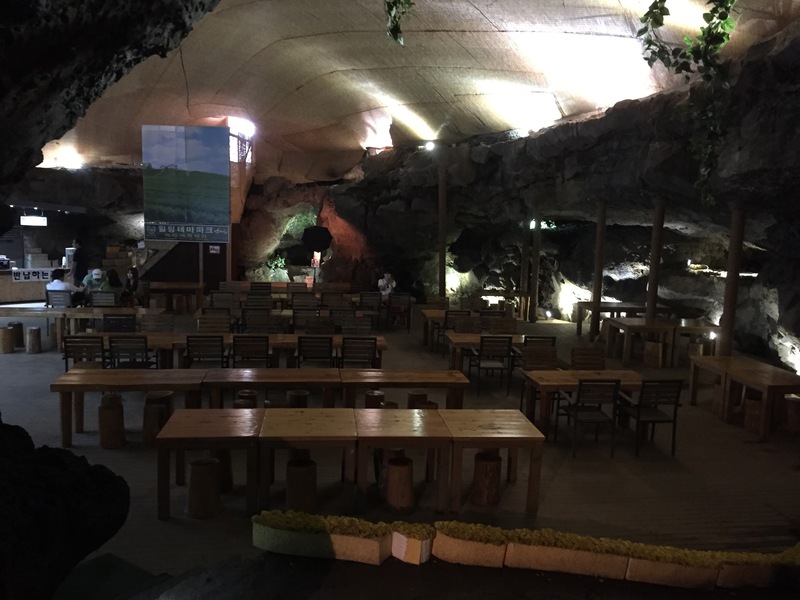 We stopped into Daheeyeon Green Tea Farm on the way to see the Manjanggul Caves. When you arrive, you can buy a beverage ticket from which includes 1 item from their tea cave cafe (up to 5,000 won) and includes entrance into their facilities. 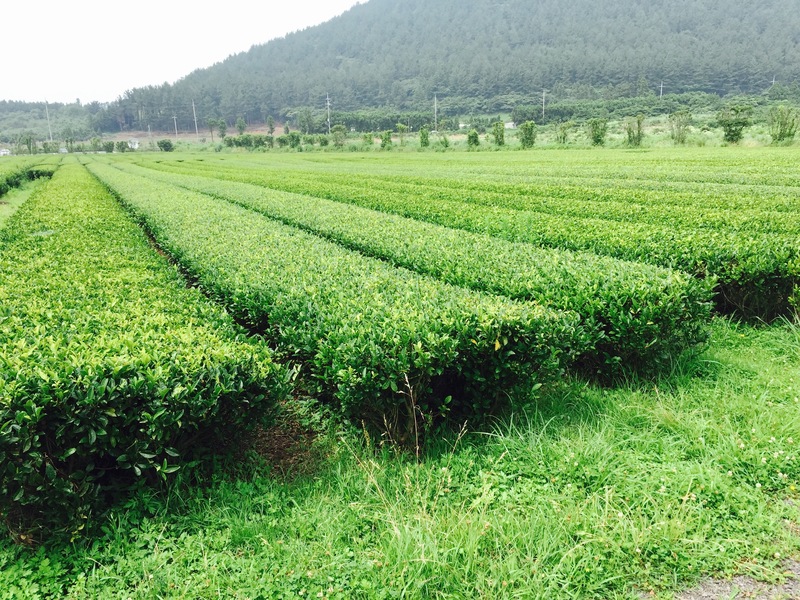 The Tea Farm itself is quite small, they do have some fun things to pose with as you walk through the gardens. In addition to the tea cave cafe, they have a restaurant upstairs that serves Green Tea BiBimBap (and other items as well). 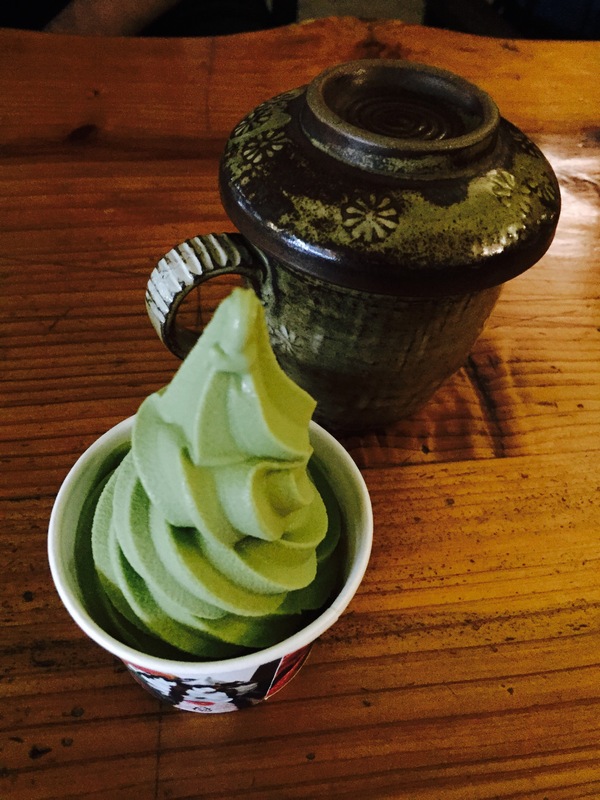 The tea cave cafe is fun to visit, we got a cup of hot green tea (made of leaves harvested in April) and a cup of their green tea ice cream. Both were pretty yummy. The farm also features a zip line experience, there were quite a few people there participating. 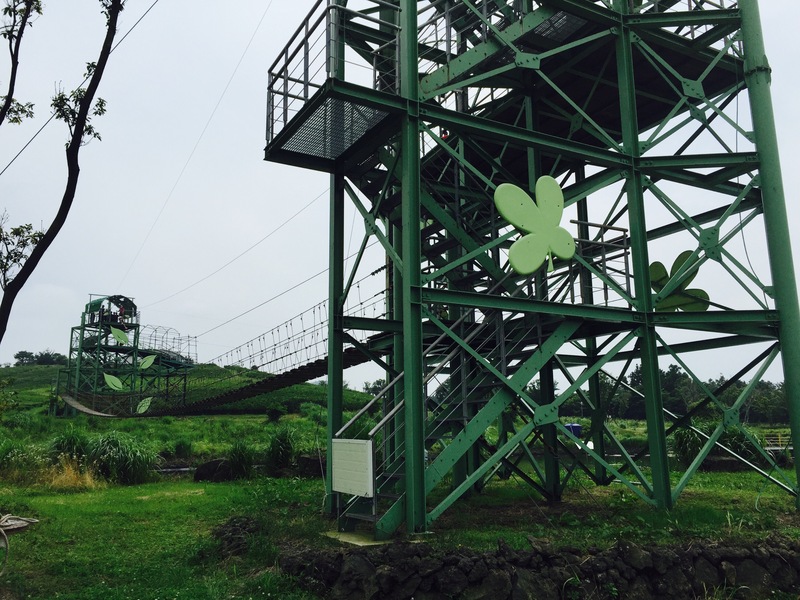 (the zip lining fee is 28,000 won). The zip lines are pretty short in my opinion, save the zip lining for a rainforest! 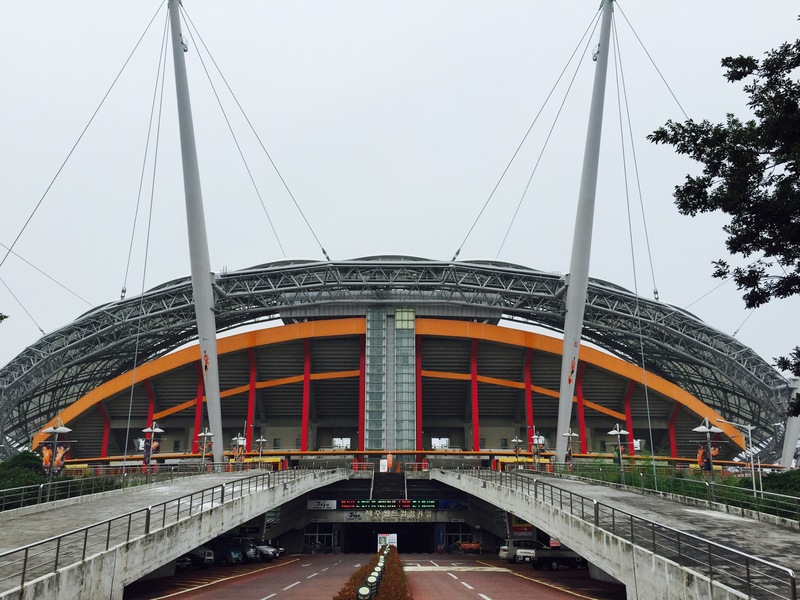 As we were driving around, we also saw the 2002 World Cup Stadium. It’s worth a stop if you’re already in the neighborhood. These were some of the places that we visited during our short trip to Jeju. There are many other sites that we didn’t have a chance to visit and we plan to head back and check some of them out before we leave Korea. I hope this helps you plan part of your itinerary if you make a trip to the tropical island. Next Post Korean Doritos Flavors – YAY!? Or NAY!? 10 Things You Should Know about Tequila! Busan or Bust - Seafood Paradise! © Connie Chen and www.qtkitchen.com, 2016-2018. Unauthorized use and/or duplication of this material without express and written permission from this site’s author and/or owner is strictly prohibited. Excerpts and links may be used, provided that full and clear credit is given to Connie Chen and www.qtkitchen.com with appropriate and specific direction to the original content.